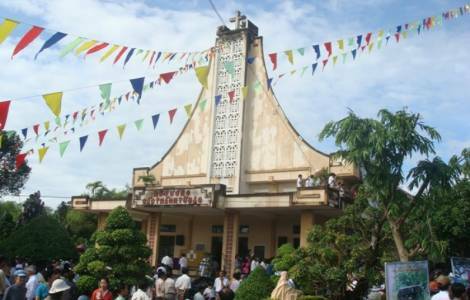 Hanoi (Agenzia Fides) - The memory of the Vietnamese martyrs nurtures faith in the present: with this spirit the Church in Vietnam celebrated a special Jubilee for the 30th anniversary of the canonization of the 117 Vietnamese martyrs. As Agenzia Fides learns, several churches throughout the country, parishes and institutions celebrated special Masses for the occasion, recalling their faith and love for God witnessed by the martyrs. "We remember with gratitude to God the sacrifices of the Vietnamese martyrs and we are inspired by their examples of faith, service and commitment", says Maria Van Dat, a lay Catholic of Hanoi, after the Jubilee celebrations, concluded on November 24th. "This is an opportunity for every Catholic in the country to nurture the seeds of faith, especially to the benefit of present and future generations in Vietnam", said Van Dat. On June 19, 1988, Pope John Paul II canonized 117 martyrs (96 Vietnamese, 11 Dominican missionaries from Spain and 10 French priests belonging to the Society of the Foreign Missions of Paris) persecuted by the Vietnamese rulers in the seventeenth and eighteenth centuries. Eight bishops, as well as priests and lay people were tortured and executed between 1745 and 1862 for refusing to renounce their faith. They were beheaded, or burned alive or left to die in cages which were too small for them to sit or stand. Christianity arrived in Vietnam in the first half of the sixteenth century. The Catholic faith was introduced by the missionaries before and during the era of French colonization and remains a minority religion in a largely Buddhist country: about 9% of the population are Christians.